Lance Mackey was named the most inspirational musher in this year’s Iditarod Trail Sled Dog Race, and Morrow from Pete Kaiser’s team was named the most outstanding lead dog. Those are just two of more than a dozen awards presented Sunday evening at the annual banquet in Nome, more than four days after Kaiser and his eight-dog team notched their first Iditarod victory. Matson Most Improved Musher Award: Given to the musher who improved his or her previous race finish by the most places. Winner: Paige Drobny jumped from 43rd place in 2016 to 7th place this year. She won $2,000 and a trophy. Donlin Gold Sportsmanship Award: Given to the musher who has demonstrated sportsmanship during the race. The recipient is chosen by mushers. Winner: Mats Pettersson won $3,000 and a trophy. Pettersson had helped fellow musher Linwood Fiedler find his dog team between the checkpoints of Rohn and Nikolai. Pettersson placed 20th in the Iditarod and Fiedler placed 12th. Most Inspirational Musher Award: Given to the most inspirational musher, as chosen by mushers. Winner: Lance Mackey, a four-time Iditarod champion, won a paid entry fee for the 2020 Iditarod. 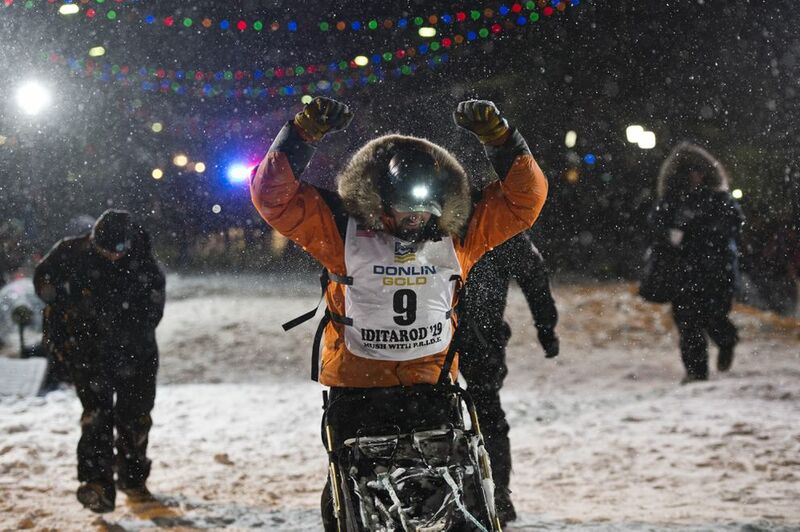 Mackey finished this year’s Iditarod in 26th place. He was previously named most inspirational musher in 2007 and 2002. Northern Air Cargo Herbie Nayokpuk Memorial Award: Presented to the person who emulates musher Herbie Nayokpuk, “The Shishmaref Cannonball," in his or her attitude on the trail. The recipient is chosen by race staff and officials. Winner: Aaron Peck won $1,049 in "pocket change" inside a Northern Air Cargo jacket. Peck placed 23rd this year. Golden Clipboard Award: Presented to the most outstanding checkpoint, as chosen by mushers. Winner: Two checkpoints won this year. Rohn and Eagle Island won a commemorative plaque. Leonhard Seppala Humanitarian Award: Presented to a musher who demonstrated outstanding dog care while remaining competitive during the race, as chosen by the veterinary team. Winner: Aliy Zirkle, who placed 4th this year, won a paid entry fee for the 2020 Iditarod and a trophy. Zirkle also won the humanitarian award in 2018, 2016, 2011 and 2005. City of Nome Lolly Medley Memorial Golden Harness Award: Presented to the most outstanding lead dog, as chosen by mushers. Winner: Morrow, a 7-year-old female dog on Pete Kaiser’s team, won an embroidered gold-colored harness. Morrow has led Kaiser’s team into Nome three years in a row. Rookie of the Year Award: Presented to the top-placing rookie. Winner: Ed Hopkins won $2,000 and a trophy for his 21st place finish. Winner: Wade Marrs and his nine dogs traveled the 22 miles from Safety to Nome in 2 hours and 38 minutes. He won $500. Marrs placed 14th. Red Lantern Award: Given to the final finisher of the Iditarod. Winner: Victoria Hardwick, a race rookie, received a trophy for her last-place finish. She and her nine-dog team got to Nome at 1:51 p.m. Monday, completing the race in 14 days, 22 hours, 51 minutes and 49 seconds. Alaska Air Transit Spirit of Alaska Award: Given to the first musher to reach McGrath, 311 miles into the 1,000-mile race. Winner: Nicolas Petit, who ended up dropping out of the race in Shaktoolik, received beaver mitts made by Loretta Maillelle of McGrath and a hat made by Rosalie Egrass of McGrath. GCI Dorothy G. Page Halfway Award: Given to the first musher to arrive in Iditarod, 432 miles into the race. Winner: Aliy Zirkle won $3,000 in gold nuggets and a trophy. The Lakefront Anchorage First Musher to the Yukon Award: Given to the first musher to the Yukon River. For the 2019 race route, this award was given in Anvik at race mile 512. Winner: Nicolas Petit won a five-course meal, $3,500 in one-dollar bills and a bottle of Champagne. Bristol Bay Native Corporation Fish First Award: Given to the first musher to reach Kaltag at race mile 652. Winner: Pete Kaiser won $2,000, a certificate for 25 pounds of fresh-caught, Bristol Bay salmon and a wood-burned art piece by Apayo Moore. Ryan Air Gold Coast Award: Given to the first musher to Unalakleet at race mile 737. Winner: Nicolas Petit won $1,500 in gold nuggets and a carved ivory dog sled team made by Leonard Savage of Holy Cross. Northrim Bank Achieve More Award: Given to the first musher to White Mountain, 77 miles from the Nome finish line. Winner: Pete Kaiser won $2,500 and a one-of-a-kind print by Anchorage artist Marianne Wieland. Anchorage Chrysler Dodge Jeep Ram Official Truck Award: Presented to the Iditarod champion since 1991. Winner: Pete Kaiser won a 2019 Ram 1500 4x4 valued at $40,000. For his first-place finish, he will also get a check for $51,299.